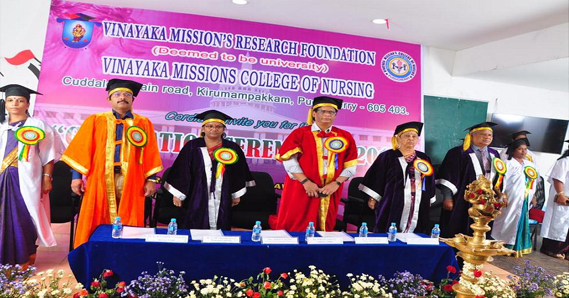 Vinayaka Missions College of Nursing, Puducherry is located in Aarupadai Veedu Medical College campus, Puducherry a municipality around 12 km from Puducherry and established in the year of 2002 under the Puducherry University. This institution is brought under the ambit of Vinayaka Missions Research Foundation in 2004 under the UGC Act, 1956 vide notification number F9-7/2002/U-3 of the Govt of India. 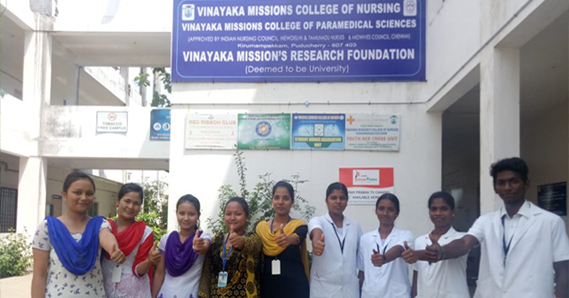 Vinayaka Mission's Research Foundation (Deemed to be University) in a B grade NAAC accredited university situated in NH, 47 Sankari Main Road, Ariyanoor, Salem, Tamilnadu – 636308. Puducherry formerly known as Pondicherry is a union territory of India. It was formed out of four exclaves of former French India, namely Pondichéry (Pondicherry; now Puducherry), Karikal (Karaikal), Mahé and Yanaon (Yanam). It is named after the largest district, Puducherry. Historically known as Pondicherry. Puducherry was the residence of Sri Aurobindo (1872–1950) and the Sri Aurobindo Ashram still operates from Puducherry. A unique experimental city Auroville, the brainchild of the mother, whose inhabitants are drawn from all parts of the world is situated on the outskirts of the city. There are several temples, out of 274 paadal petra sthalam Shiva Temples, the Puducherry region is owning 1 temple is the world famous Manakula Vinayakar Temple, churches, monuments, parks and mosques which attract tourists. So visiting such ancient temples would definitely give more spiritual vibrations to the tourists. Beach and beach resorts attract 1000 of tourist every day. The strong desire of a philanthropist and educationist, Dr.A.Shanmugasundaram, to develop education paved the way for the establishment of Thirumuruga Kirupananda Variyar Thavathiru Sundara Swamigal Medical Educational and Charitable Trust at Salem, Tamil Nadu, India. 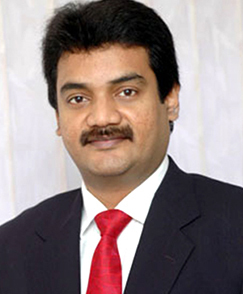 He is the Founder and Chairman of the Board of Trustees of the Vinayaka Missions Trust. By his zeal, dedication and untiring effort he made a niche for himself to the cause of education. His bold and strong conviction is "Education is a important instrument for social change". 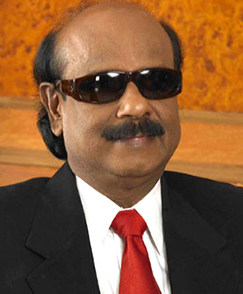 His main objective is to make education reachable to the masses. In pursuance of this objective, the University has established various educational institutions in the fields of medicine, dentistry, nursing, allied health sciences, engineering, management, computer science applications and basic sciences, thereby contributing to the global needs for knowledge and education. Vinayaka Missions has translated its Vision "to achieve excellence in education for the enrichment of the society" through its Missions of "spreading education globally" and successfully established many international co-operations across the globe. Vinayaka Missions Research Foundation excels in diverse disciplines through dedicated teaching by distinguished academicians. The University offers excellent infrastructure and right ambience to its students and constantly aims at achieving 'Excellence in Education'. The students acquire knowledge, self-confidence, moral values, leadership and skills in their chosen fields to meet the challenges of the competitive world. In fact, studying in the University is a rich and rewarding experience for the students. Recognizing the commitment of VMU in the field of education, a number of Government and private agencies from abroad have evinced keen interest in associating themselves with Vinayaka Missions University (VMU) which has resulted in many international tie-ups across the globe.